I wanted to give you guys a preview of the game in case you wanted to learn more about it before you buy or rent it. (If you haven’t already pre-ordered it, that is!)  So I’m going to talk a little bit about the story, gaming quality, villains, and a little information about what other game reviewers are saying about it. I’ll let you decide if you want to play it or not. 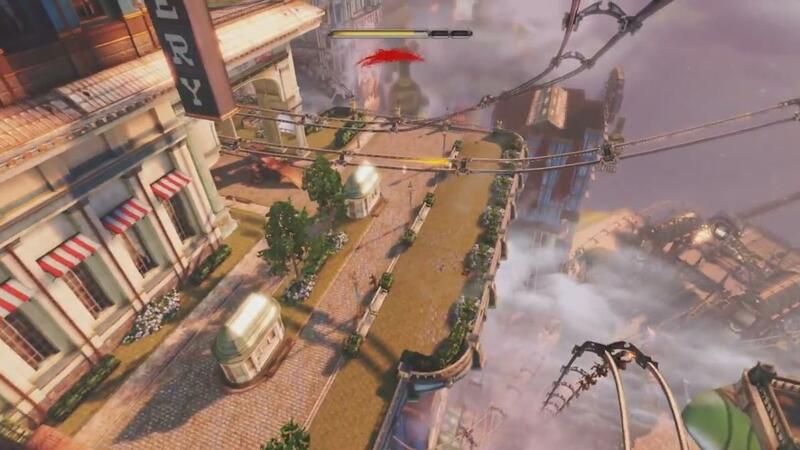 The game begins at a lighthouse off the coast of Main in an alternate universe’s United States in the year 1912. 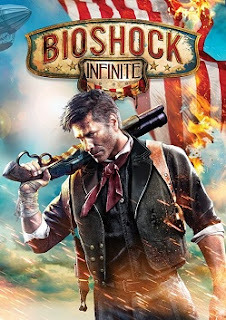 You are Booker DeWitt, former Pinkerton agent turned PI. You have accepted a job to rescue a powerfully gifted young woman named Elizabeth who is held in captivity in Columbia, the floating city known for its worship of Constitutionalism and the Founding Fathers as well as its theocratic system of white supremacy lead by the mysterious “American Prophet,” Zachary Hale Comstock. Columbia is on the brink of civil war between Comstock and "the Vox Populi, a violent leftist group modeled partly on the socialists and anarchists of the period." (New York Times). Throughout the rescue process Booker and Elizabeth form a strong bond and the game hinges on this bond for the rest of the story. The player’s job is to get Elizabeth out of Columbia and safely to New York City, while both sides of the war are hunting you down to get Elizabeth back. And don't forget about Song Bird, Elizabeth's guard and sole companion for the past twelve years. He's pretty darn mad that you took her away. 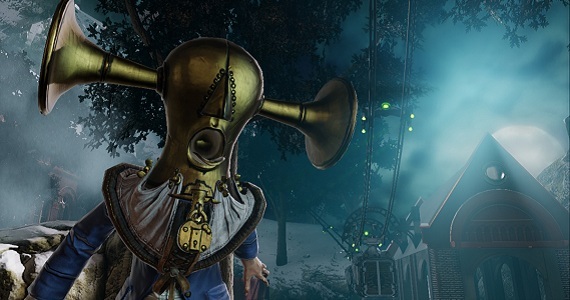 BioShock Infinite is basically a first person shooter game, but the Elizabeth AI and Booker’s special powers (called vigors) add interest to the overall gaming experience. 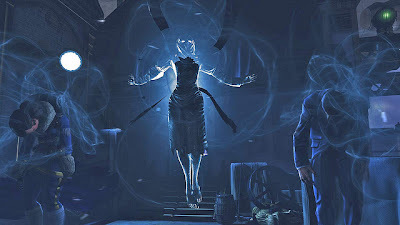 One of the biggest concerns people have with games that have main characters that are AI’s is “Am I going to have to drag this AI along throughout the whole game?” and “Will the AI detract from my overall experience?” Irrational Games has put a ton of thought into the AI of Elizabeth. They have created an AI that not only pumps up the story line but, interacts with the player at all times, whether it’s through dialogue, tossing the player healing potions, collecting coins and interacting with the environment, and even presenting the player with additional options mid battle. 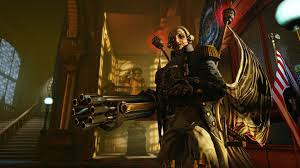 Elizabeth’s giftedness is the ability to interact with the space/time continuum through what she calls “tears.” These tears exist all over Columbia and Elizabeth has the ability to pull objects through the tears, things to hide behind, additional weapons like Gatling guns, boxes of healing supplies, etc. This really allows the player to specify her/his playing style and makes every person’s experience truly unique. 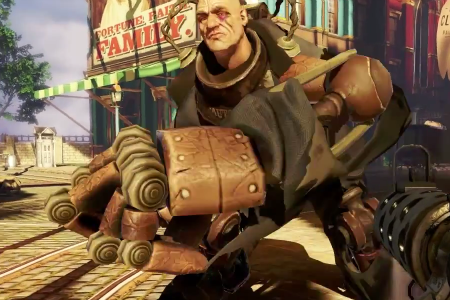 Booker’s special powers are dependent upon special gear and potions called vigors, much like plasmids and tonics from the original BioShock, and enchantments and bone charms in Dishonored. These special abilities can range from telekinesis to animal control. These vigors become permanent and cannot be change later in the game, but they can be upgraded and modified through gears, so choose wisely! Vigors also use up salts (kind of like manna). The Skylines should really add extra oomph to the game! In the game you will have several different kinds of villains you come across and have to shoot your way through, but the ones that will be the most challenging are what Artistic Designer Ken Lavine calls the “Heavy Hitters,” also known as The Motorized Patriots, The Handy Man, The Boys of Silence, and The Siren. The Motorized Patriots. Long live the Forefathers! The Motorized Patriot is a robotic soldier with the porcelain face of George Washington. This enemy is ruthless and, because it’s a robot, it literally will not stop coming at you until you take it down. It uses a rapid firing machine gun (much like a defense turret). As you break this enemy down the porcelain George Washington face flies off to reveal the very eerie (almost zombie like) inner workings of the robot just before it gets destroyed. The Handy Man is a human man who has been grafted into this metal suit. As the player works through the game we learn why they are in the suit in the first place and Ken Lavine says, “there’s a certain sadness to who they are and how they got there.” These guys are extremely agile for their size and they can pick up nearby friends and foes and throw them across the battle area, so no one is very comfortable around them. Needless to say these guys are a very formidable enemy! The Boys of Silence. What is really inside that helmet? The Siren: wouldn't want to meet her down a dark alley! The Sirens are a very interesting enemy in the fact that they are mediums, so to speak, between our world and the dead. These grizzly ladies call upon past foes that the gamer has already defeated and you have to decide if you are going to take out those old foes first or destroy the Siren, because if she dies her reincarnations die too. Needles to say I think this is a game that definitely needs to be checked out! I’m sad that I will be out of town for the next two weeks and away from my Xbox 360, therefore you’ll have to find out how epic this game is on your own! I hope your interest is peaked!